(Nanowerk News) Scientists have identified a complex chemical reaction responsible for the degradation of two paintings by Vincent van Gogh and other artists of the late 19th century. This discovery is a first step to understanding how to stop the bright yellow colours of van Gogh's most famous paintings from being covered by a brown shade, and fading over time. In the meantime, the results suggest shielding affected paintings as much as possible from UV and sunlight. 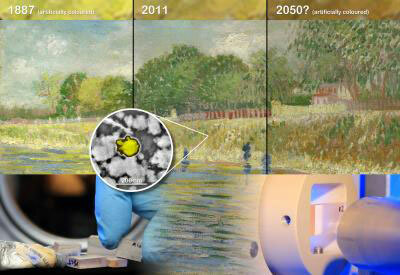 The results are published in the 15 February 2011 issue of Analytical Chemistry ("Degradation Process of Lead Chromate in Paintings by Vincent van Gogh Studied by Means of Synchrotron X-ray Spectromicroscopy and Related Methods. 2. Original Paint Layer Samples"). This is an image, made using an optical microscope, of the sample taken from "Bank of the Seine" studied with synchrotron X-rays. The brown layer on top of the paint is varnish, it appears opaque but in reality it lets light through. 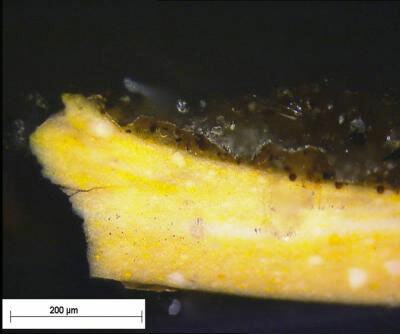 The brown pigments are invisible to the optical microscope. They are located at the interface between varnish and paint, in a layer less than three micrometers thick. The scale bar at the bottom indicates the size of the sample. This illustration shows how X-Rays were used to study why van Gogh paintings lose their shine. Top: a photo of the painting "Bank of the River Seine" on display at the van Gogh Museum, divided in three and artificially colored to simulate a possible state in 1887 and 2050. Bottom left: microscopic samples from art masterpieces moulded in plexiglass blocks. The tube with yellow chrome paint is from the personal collection of M. Cotte. Bottom right: X-ray microscope set-up at the ESRF with a sample block ready for a scan. Centre: an image made using a high-resolution, analytical electron microscope to show affected pigment grains from the van Gogh painting, and how the color at their surface has changed due to reduction of chromium. The scale bar indicates the size of these pigments. In the decisive step, two techniques were combined using a single X-ray beam at the ESRF: X-Ray fluorescence (XRF) and X-Ray absorption near-edge spectroscopy (XANES). For the XRF, the microscopic beam size (0.9 x 0.25 ?m?) made possible to separate the study of degraded and unaffected areas, and the XANES technique proved the speciation of chromium, i.e. the reduction from Cr(VI) to Cr(III). "Our X-ray beam is one hundred times thinner than a human hair, and it reveals subtle chemical processes over equally minuscule areas. Making this possible has opened the door to a whole new world of discovery for art historians and conservators," says Marine Cotte, an ESRF scientist also working at CNRS/Mus?e du Louvre.